Goal 1: Increase Region participation and influence at the Local and State ACSA level. Increase charter participation in Region professional development and other events. Goal 2: Proactively interact with potential members and increase membership. Goal 3: Recognize and celebrate the accomplishments of administrators and students. Goal 4: Increase ACSA/Region 17 visibility and strengthen connections with District and charter leaders. Goal 5: Continue to cultivate relationships with Region 17 business partners. Goal 6: Provide professional opportunities for new and experienced administrators that enhance equity, diversity and access. 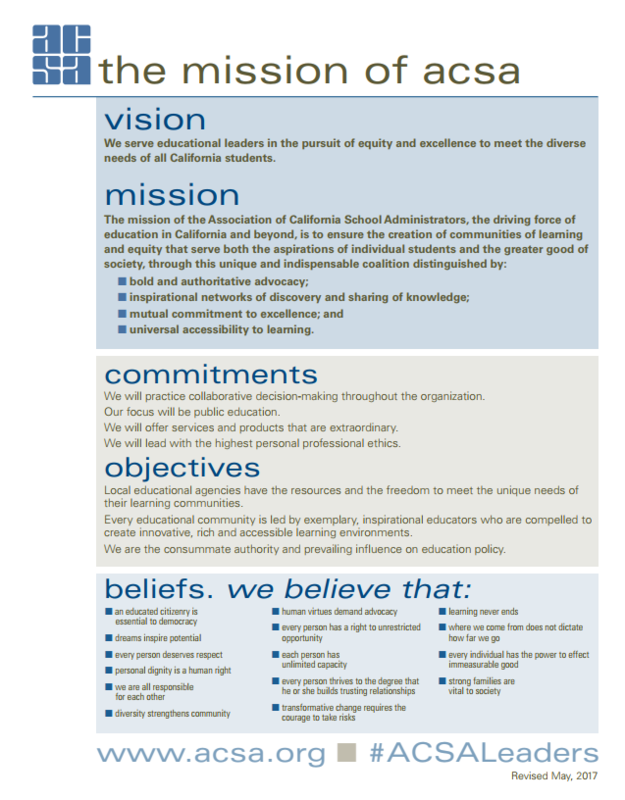 Goal 7: Increase communication between the Region 17 Board of Directors and Region committees, councils and charters; and between Region 17 and State ACSA.